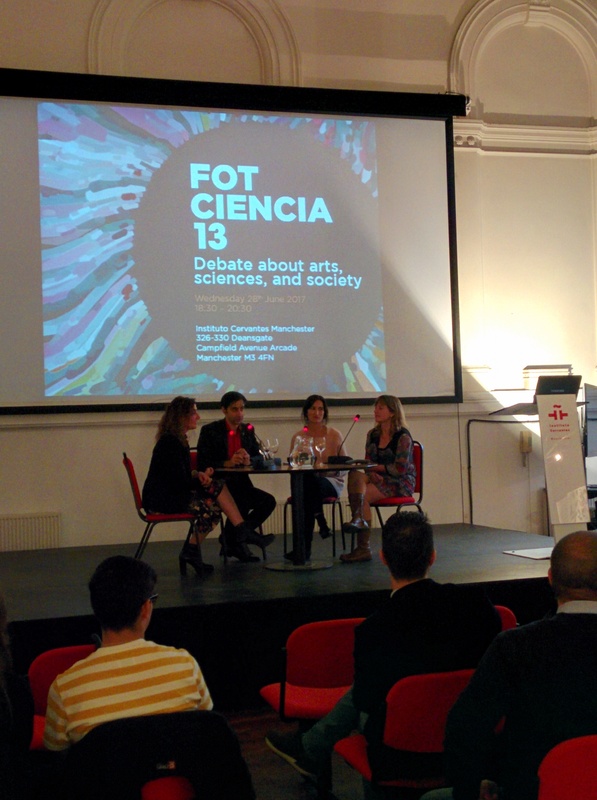 Last 28th June, the Instituto Cervantes Manchester hosted a debate about “Arts, Sciences and Society” organised by the Office for Cultural and Scientific Affairs of the Spanish Embassy in London, the Spanish Foundation for Science and Technology (FECYT), and the Instituto Cervantes Manchester. Although the arts and the sciences may seem two sets of disciplines that seldom interact, this occasion served to learn about the experiences of an artist and a scientist who have worked in the confluence between both sets of disciplines. 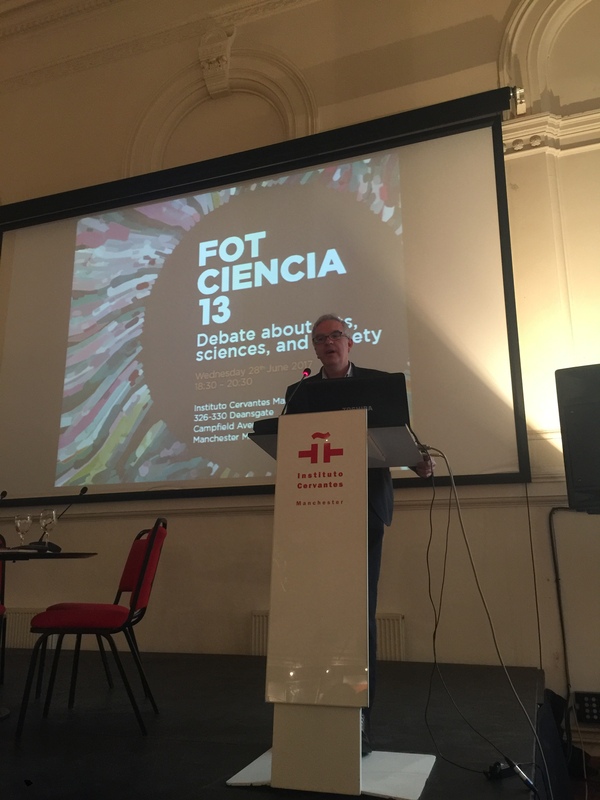 With the FOTCIENCIA 13 exhibition as the perfect setting, the session was inaugurated by the Director of the Instituto Cervantes Manchester, Francisco Oda. He welcomed all attendees and highlighted that the scientific content is heavily important in their annual programme of activities, referring to the following examples: the cycle “Spain: Science is the Key”, the collaborations with the Society of Spanish Researchers in the United Kingdom (SRUK/CERU), or the FOTCIENCIA 13 exhibition that can be visited until the 20th September. 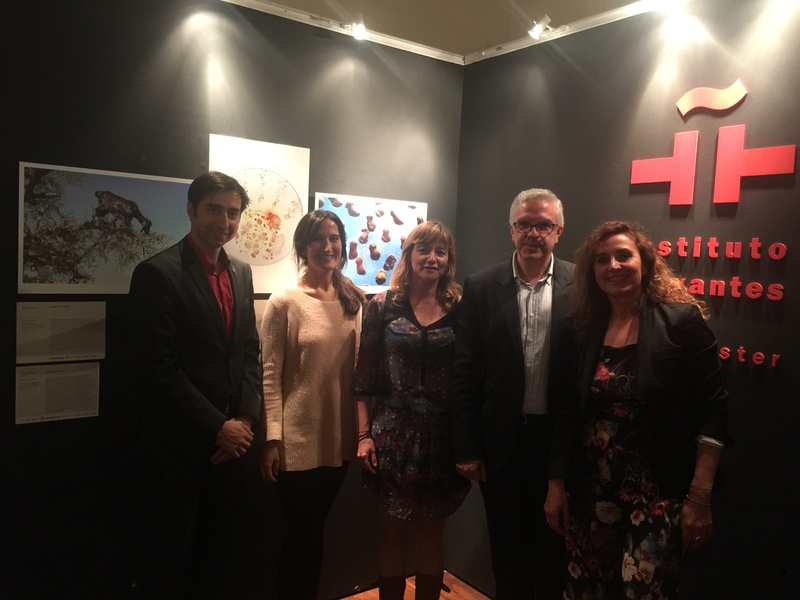 Next, the FECYT scientific coordinator in the Spanish Embassy in London, Lorenzo Melchor, officially inaugurated the scientific-themed picture exhibition stressing out that photography can be used as a “powerful tool” to explain complex scientific concepts in a visual and artistic way. He stated that this session was part of the set of cultural and scientific promotional activities that the Embassy of Spain is carrying out in Manchester during 2017. After all, Lorenzo introduced the two main speakers of the debate. Spanish artist Quintina Valero explained her career as a graphic reporter, and her commitment with social issues and humanitarian crises. Through her experiences, Quintina illustrated how good photography can trigger social interest and so, she showed her project “Clouded Lands”, done in collaboration with her collective group “Food of War”. During this project, Quintina had collaborated with scientists to take pictures in areas still affected by the Chernobyl nuclear disaster. During her explanation, she showed some pictures of plants adapted to grounds with high radiation, experiments in the lab with proteins, cellular tissues with chromosomal aberrations, mutant organisms, etc. She thus explained: “with some of these images we aimed to bring the attention to some consequences of the disaster that even today seem to be covered, and we also wanted to show in a graphic and imaginative way the impact of genetic alterations in the DNA”. 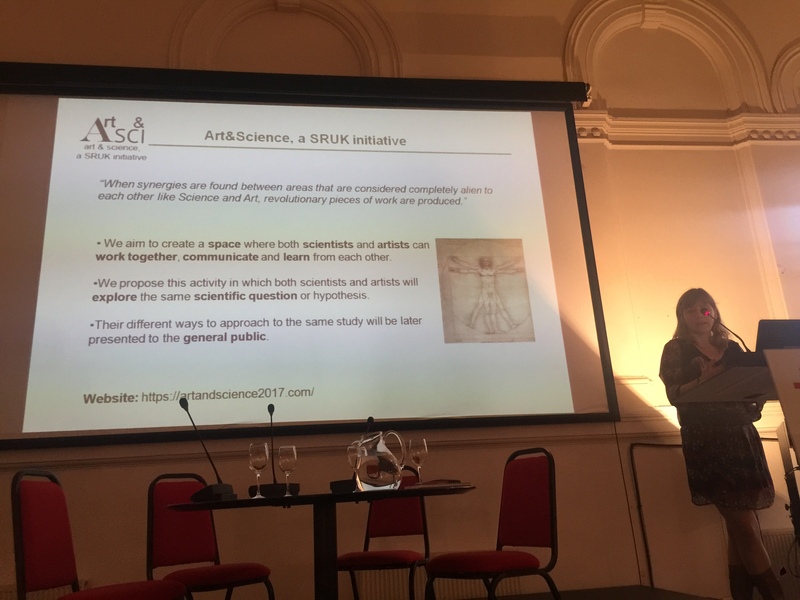 Spanish scientist Anna Vilalta introduced “Art&Science, an SRUK initiative”, a project where SRUK has gathered both artists and scientists to create artistic works that are able to convey scientific concepts. The project had the sponsorship of the Fundación Ramón Areces and Fundación Telefónica. According to Anna, “it was such an enriching experience for everyone, and we were amazed by the diversity of formats and scientific concepts; we made use of sculpture, painting, photography, cinema or theatre to deal with concepts from genetics, ecology, biomedicine, physics and other disciplines. All pieces together, we have arranged a touring exhibition that will go to Cambridge, Madrid and possibly Manchester”. 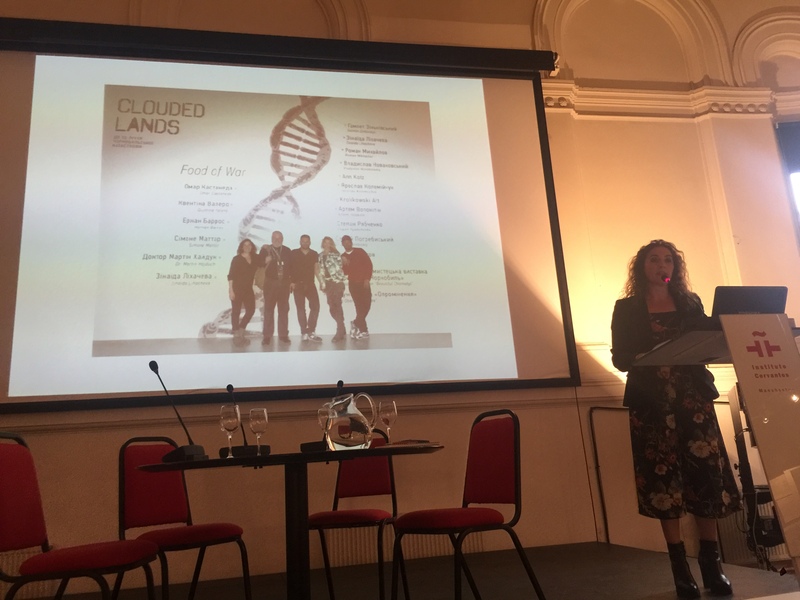 Next, there was a colloquium with both speakers and the Cultural Director of the Instituto Cervantes Manchester, Paula Olivares, chaired by Lorenzo Melchor. The debate covered a wide range of topics around scientific culture and communication. For Valero, the scientific language constitutes “such an absolute barrier”, so she really acknowledges when a scientist explains something without the use of technical words. Vilalta stated that more science communication and outreach is needed to foster critical thinking in society and also to improve funding for research and development. Olivares reckoned that Spanish society is starting to place value on cultural activities, exhibitions or scientific outreach seminars, but still there is much road ahead to increase the audience, to improve public funding, and to foster more private funding and sponsorship. Olivares also opened the debate around the accuracy and scientific rigour in films. Both Vilalta and Melchor replied that although the maximum possible scientific accuracy is always desired, sometimes it can be “sacrificed” for the sake of achieving a masterpiece film able “to inspire and make the future generations dream”, as they will be the ones continuing with our scientific research and endeavour. FOTCIENCIA 13 is the thirteenth edition of an annual contest of scientific-themed pictures. FOTCIENCIA is organised by the Consejo Superior de Investigaciones Científicas (CSIC), the Spanish Foundation for Science and Technology (FECYT), and the Fundación Jesús Serra. It is composed of 49 pieces that explain scientific concepts in a graphical and visual way. The exhibition has been touring across Spain in town halls, museums, universities, research centres and public spaces. In 2016, it was exhibited in the Spanish Embassy in Berlin. For the first time in its history, the exhibition is shown in the United Kingdom thanks to the Spanish Embassy in London, FECYT and Instituto Cervants Manchester. 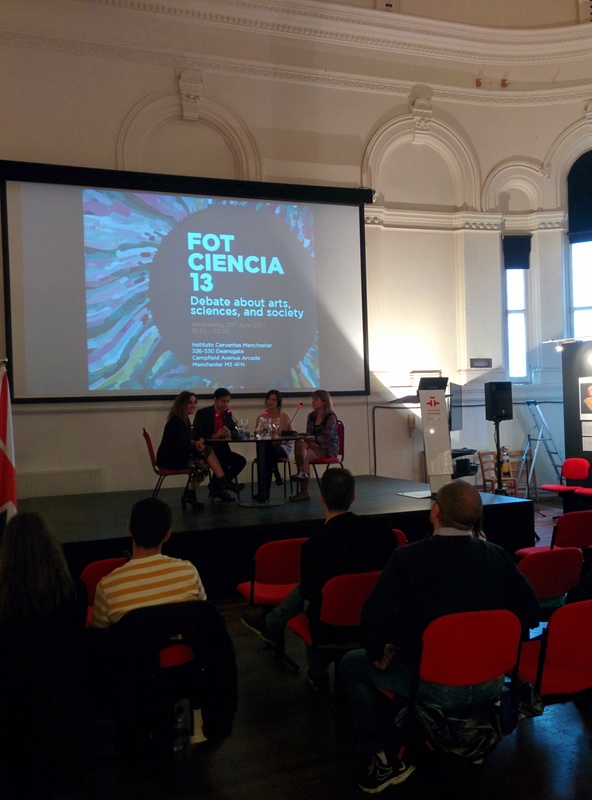 FOTCIENCIA 13 can be visited from 24th May to 20th September 2017 in the Instituto Cervantes Manchester. More information, click here.